Not the frequent landslides but demonetization drastically affected the progress of work in Jammu and Kashmir’s longest Chenani-Nashri road tunnel, delaying its opening now by more than three months. NHAI has called ‘Force Majeure’, an unprecedented and unforeseeable circumstances that prevented them from fulfilling the contract. National Highway Authority of India (NHAI) which overlooks the construction work of the India’s longest tunnel along with the contractors including the local Beigh Construction Company (BCC) had to reduced the pace of work significantly. According to the Independent engineers (IEs) report, a copy of which is with Kashmir Life, demonetization from November 8, 2016 till date, resulted in work getting affected drastically since the contractors failed pay the labour involved in the work. Report says that the contractors were unable to collects the tool and tackles of small amount due to restrictions of amount withdrawal from the Bank accounts. Also the sub-contractors of NHPC were not able to pay to daily wage labour which was around 200 besides being unable to purchase the essential material from local market due to non-availability of cash. Owing to this serious situation, NHAI reconsider this event as Force Majeure for toll roads vide the circular no. NHAI/CGM/BOT(FIN) 2016-17 dated 29-11-2016. This 9.2-km-long tunnel will connect the Chenani (south end) area of Udhampur district with the Nashri (north end) area in Ramban district and will reduce the length of Jammu-Srinagar highway by around 31 km. The tunnel is now likely to be inaugurated by Prime Minister Narendra Modi on March 8, 2017. This 9.2-km-long tunnel will connect the Chenani (south end) area of Udhampur district with the Nashri (north end) area in Ramban district and will reduce the length of Jammu-Srinagar highway by around 31 km. 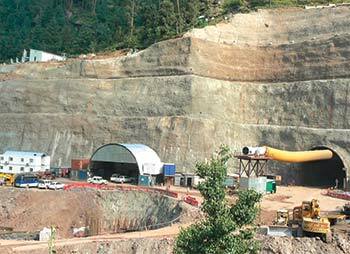 The tunnel will bypass the hilly terrain of Patnitop and will make the movement of people easy. The Jammu-Srinagar national highway is a lifeline for Kashmir valley, Ladakh and several districts of the Jammu region on which more than 15,000 vehicles ply on daily basis. Convoys of security forces also move on this highway and at the time of rain or snow traffic gets disturbed. The construction of this tunnel will allow all-weather road. Confirming this, Business Development Executive (BDE) of Beigh Construction Company (BCC) Shafaq Syed said “Demonetization crippled our working. We were unable to make payments to our sub-contractors. Paying wages had become impossible.” He added that the event led to project completion getting delayed. “We were worried about being unable to meet the target. But now the project is complete. Safety audit is in the final stages. Once it is complete, the tunnel would be thrown open for traffic,” added Shafaq.